bl.uk > Online Gallery Home	> Online exhibitions	> Asia, Pacific and Africa Collections	> In Eden Gardens, Calcutta. 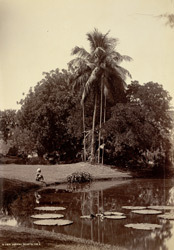 Photograph from the Elgin Collection: 'Spring Tours 1894-98' of the an ornamental pool and palm within the Eden Gardens, Calcutta, taken by Bourne and Shepherd in the 1890s. The Eden Gardens, situated at the northern end of the Maidan, Calcutta, was named after Emily and Fanny Eden, the sisters of Lord Auckland, Governor-General from 1836-1842. The sisters tended the garden when it formed part of the Viceroy's estate and later it became a famous public garden, which now contains Calcutta Cricket Club. Eden Gardens also contains a Pagoda, brought from Prome in Burma and erected in 1856, by Lord Dalhousie, the then Governor- General.